Transmission, aerodynamics, and tuning help new Jetta gain a couple miles per gallon. Volkswagen debuted the all-new 2019 Jetta in January, streamlining the powertrain lineup to just one available engine and two transmission choices, which will both deliver the same efficiency. Until the arrival of a sporty GLI trim, a 1.4L turbo four-cylinder is the only power source in the Jetta, and whether you opt for a six-speed manual or the eight-speed automatic, the EPA expects you to get 30 miles per gallon in the city, 40 mpg in highway driving, and a combined 34 mpg. These figures beat the automatic-equipped 2018 Jetta 1.4T by two mpg in every category, although the manual is only improved 2 mpg in the city rating and by 1 mpg in the overall. The improvements didn’t come from shrinking the engine as the 1.4T is not new to the lineup, but power is down a smidge at 147 hp (150 for the 2018 Jetta 1.4T) and torque remains the same at 184 lb-ft. Its pairing with an eight-speed automatic is new, however, and offers benefits to both acceleration and efficiency, and comes with a Start/Stop system to save fuel at lights and other stops. Other gains come from a more efficient air conditioner that reduces pumping losses, a smoother-flowing grade of oil, low rolling-resistance tires, and sleeker aerodynamics. The body has been fine tuned in every regard, deploying active front grille shutters that close at certain speeds, an “air curtain” front bumper, and underbody panels and rear end that reduce turbulence, all contributing to a class-leading 0.27 coefficient of drag. However, despite the improvement, the Jetta doesn’t leap to the head of the compact pack. The Honda Civic 1.5T beats it by 2 in every measure, claiming 32/42/36 mpg city/highway/combined, as per EPA. If you do a lot of highway driving, the Chevrolet Cruze diesel delivers an 47 mpg on the highway, and 37 overall, but at least it matches the Toyota Corolla Eco, which makes its gains by CVT. 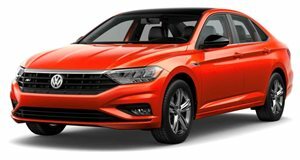 While the Jetta has always relied on diesel models as its efficiency champs, the new model will have to appeal to Corolla and Civic shoppers on equal efficiency footing while hoping its interior, driving manners, and conventional looks draw people away from those default choices.